With the new addition of Jacquard Piñata Alcohol Inks to Jackson’s store, we asked alcohol ink artist and art therapist, Jenna Ferguson, to test them out with Legion Yupo Heavy Paper. She shared her findings with us here saying ‘I was delighted by the interesting range of pattern and colour created’. Read on to find out more about Jenna, her work and her Instagram Giveaway. Alcohol inks are a fun fluid art medium that can be used to create really unique and interesting art. They’re very versatile and can be used in lots of different ways using a wide range of techniques. The painting process can be both fascinating and mesmerising as the inks move around and dry to create the most beautiful effects. After trying them it’s easy to see why they’re becoming so popular! Items in Jenna’s Instagram giveaway. 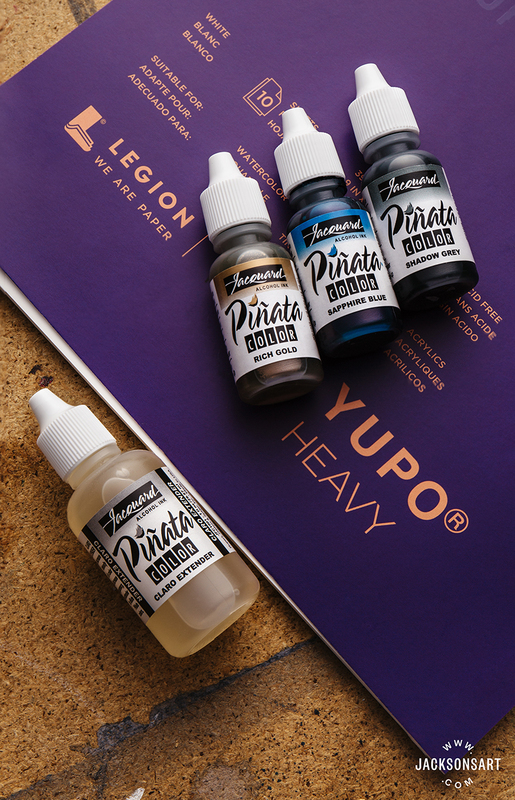 In this review, I tried five ink colours from the Jacquard Piñata range and painted onto Legion Yupo heavy paper. I have to say, this is, without doubt, the best quality Yupo paper I have tried. It’s really thick and sturdy which is great as you’re able to pick up the paper while the inks are still wet and move it around to create effects in the ink as they dry. The range of Jacquard inks are fabulous. The colours are really bright and vibrant and they have a wide variety of colour choice, as well as a range of metallic mixatives to add to the inks. Before painting, I often create ink colour swatches of the inks I’m thinking of using. Sometimes different coloured undertones can emerge from the inks when isopropyl alcohol is added to them, so creating swatches gives me an idea of which colours will work together. I then pre-mix the inks I’d like to use with isopropyl alcohol and put the colours into pipettes. I love the vibrancy of these inks when they’re poured onto the paper. I keep the paper wet and gradually add each colour, while continually blowing the inks around with a straw to create patterns and merge the colours into each other. The gold mixative looks striking against the other colours and I love the way it mixed with the inks and created different effects depending on how much I added and how much I moved it around with the other inks. The inks blended wonderfully together and I was pleased with the variety of marks they left as they dried. I was happy that even though I had kept the paper really wet, when the inks dried it hadn’t warped and had maintained its original rigidity. The inks had thoroughly dried within about 10-15 minutes and I was delighted by the interesting range of pattern and colour created. Check out Jenna’s Instagram page @jennafergusonart to see videos of how she created this piece. “I’m an Art Therapist from Scotland and I use art as a way to help others express their feelings. I support children who are looked after within the care system, as well as young people who have been diagnosed with cancer. I have a degree in Psychology with Honours (University of Glasgow) and I qualified for my Masters degree in Art Psychotherapy with distinction (Queen Margaret University in Edinburgh), and so my skills and knowledge are in the emotional benefits of creativity. While I was on maternity leave I began to use alcohol inks for my own creative outlet and was immediately drawn to their therapeutic qualities. The process of using this fluid art medium is both intuitive and expressive; my pieces are often a result of playful spontaneity without having a predetermined plan for the finished product. 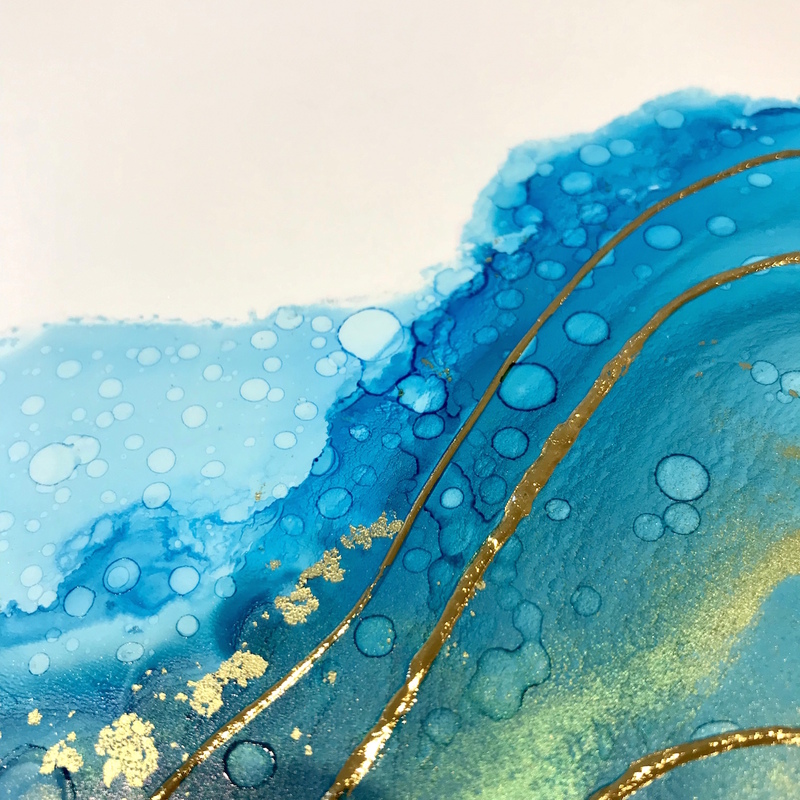 My work usually consists of multiple layers and I love to combine alcohol inks with other mixed media, such as beautiful gold leaf detailing to accentuate the ink underneath. Clare: Who are your top three favourite artists? Jenna: That’s a hard question because I’m inspired by so many artists! I’ve found using Instagram has been an amazing way for me to connect to a vast community of artists and it’s through this I’ve discovered so many artists I might not otherwise have come across. So this might not be your typical response to this question, but my favourite artists are all inspirational women whose art I adore through Instagram. Similarly to me, all are inspired by nature, especially the sea and the sky, and they create art that really speaks to me. Phoebe is originally from England and now lives by the ocean in New Zealand. 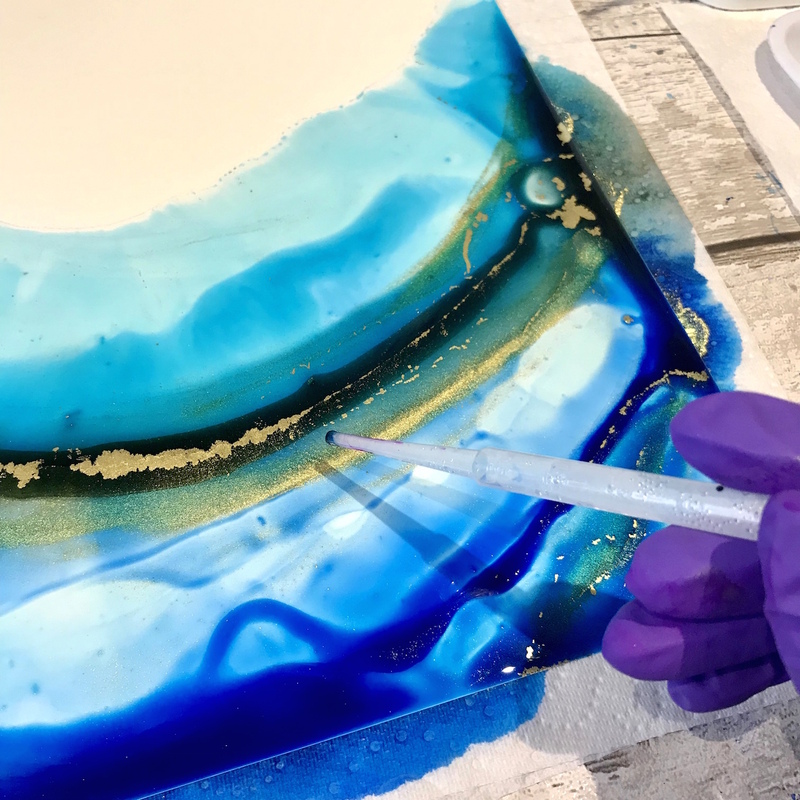 She uses a variety of mediums in her work including alcohol inks, but most recently her ocean inspired resin pieces are just amazing. I love to get to know more about artists whose work I admire, and I enjoy Phoebe sharing about her life as a mother of 3 and as an artist who like me, is trying to use her love of creating art as a way of supporting her family while also being able to spend as much time with her children as possible. 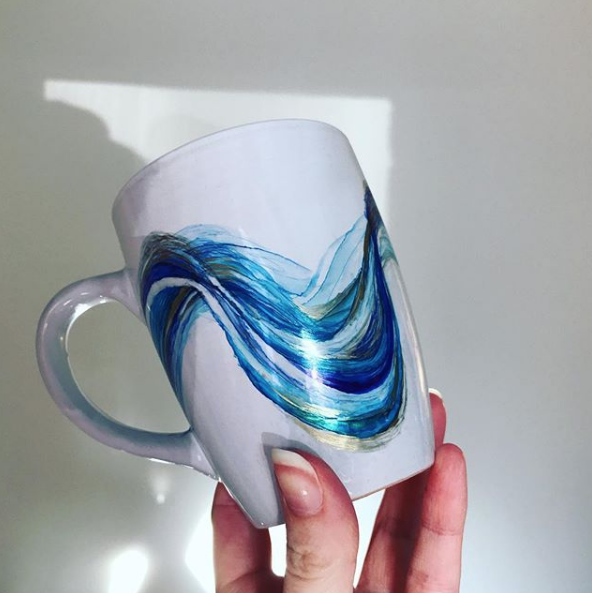 Wendy is wave obsessed and I love it! 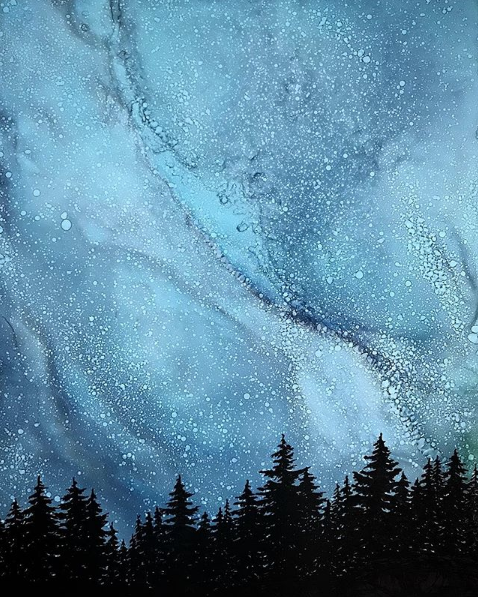 She uses a range of mediums but often alcohol inks, creating detailed paintings inspired by the Oregon coast where she lives. Wendy finds real joy in the process of painting her water-like images, which is something I relate to. I’m enjoying following her journey as a self-taught artist who is embracing her new found love of painting while sharing her reflections of what her art means to her. Jess is at a stage of being an artist that I aspire to be. 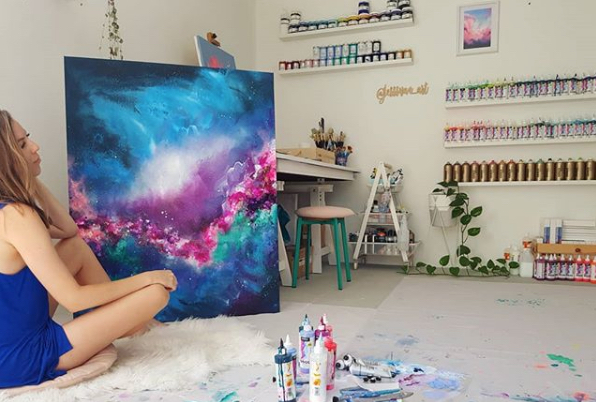 She creates the most beautiful abstract paintings that I really connect to. Her art draws you in and the colours she uses are just amazing. She shows confidence in her work while she also shares her journey of learning and growing. From Perth, Australia, Jess is a self-taught artist but has had her own solo art shows. She is another mum who is trying to share her art as a way of doing what she loves while finding a good work-life balance. Jess’ work is admired worldwide and the videos she shares of her art process inspires artists to embrace creativity and enjoy the process. 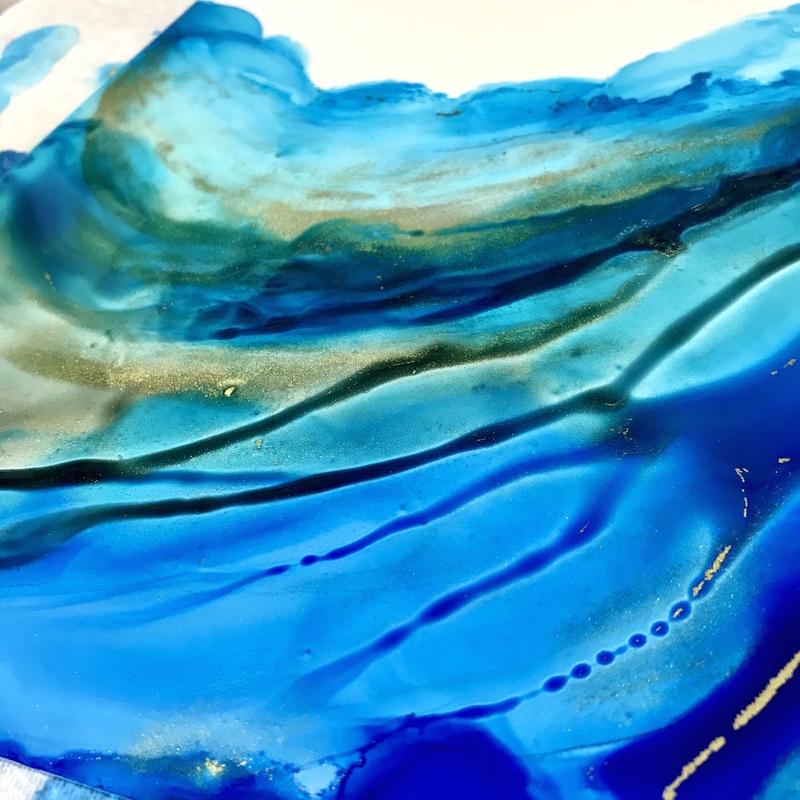 Clare: Do you use alcohol inks in your art therapy sessions? What other mediums do you use? 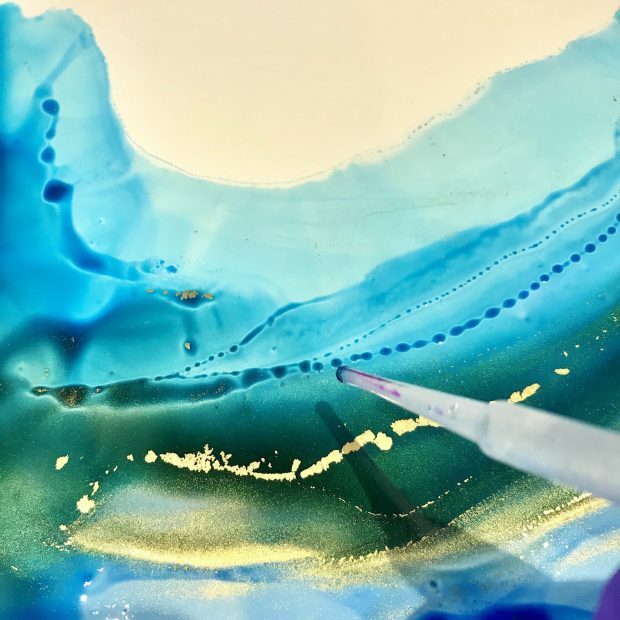 Jenna: I haven’t used alcohol inks in therapy sessions yet because I work with children and I would need to give careful consideration to how this could be done in a safe way, as the process of using alcohol inks involves mixing them with isopropyl alcohol, which is a toxic liquid. Likewise, it’s unfortunately not something I’d be able to use with cancer patients. So although it’s definitely a medium which has huge therapeutic potential it’s not something I’ve been able to incorporate into my work as a therapist yet. Other mediums I use in my own art expression include a range of mixed media. I particularly love the Pebeo brand for this – especially their gold leaf and gold foils. 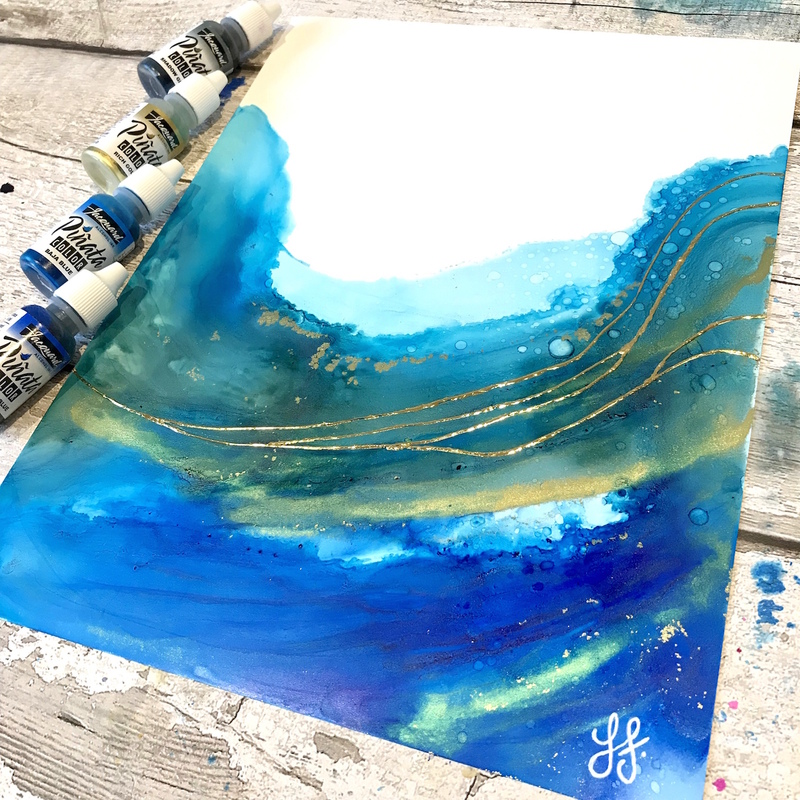 I also love to paint using acrylics and create layers of texture – although it’s not something I’ve done much of since discovering my love of alcohol inks! Lately I’ve been experimenting by adding resin to my paintings, and this is something I plan on doing more of and developing my skills with. Clare: You have experimented in painting objects like mugs and tiles. Do you intend to continue exploring this avenue? Where else would you like to see your work and what other objects do you have in mind to paint? Jenna: Yes, I definitely intend to continue exploring alcohol inks on ceramics. It’s so much fun to do and can create really striking results. I’m enjoying making sets of coasters on ceramic tiles at the moment as this kind of art-making really fits in well with how busy my days are just now – I’m off work on maternity leave, and with two little ones there isn’t always a lot of time for creativity! Using alcohol inks to create coasters means I can do a little at a time, one layer of the process, then easily put it aside to go back to the next time I get a chance. In terms of other places I’d like to see my work – the sky’s the limit! I’ve already had my paintings printed onto luxury, 100% pure silk scarves, and I’ll be launching this product for sale within the next couple of months. I can see so much scope for my art to be reproduced onto a range of products and it’s something I’m excited to explore further. I also intend to continue creating original paintings and would love to see my work displayed in other art galleries in the future. I’m really proud to have sold paintings across the world, it makes me so happy to send my work to places as far away as California, or Japan! I’m hopeful this will continue as I develop as an artist. One of Jenna’s experiments with painting on mugs. 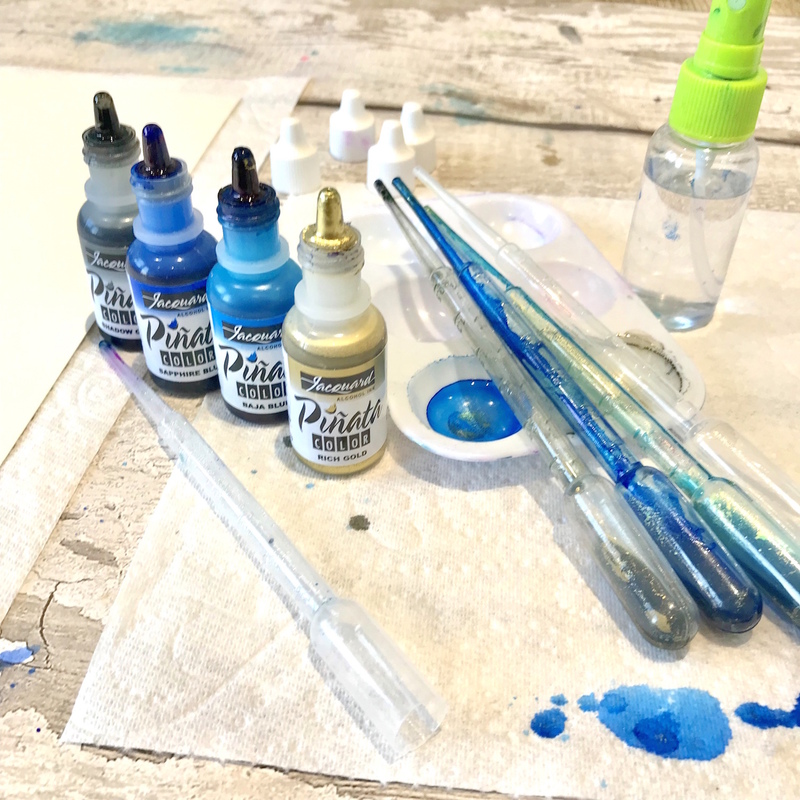 Clare: What advice would you give to anyone wanting to start out with alcohol inks? Jenna: If I could encourage anyone starting out with inks (or possibly any medium for that matter) it would be just to play! Inks offer endless opportunity for self-expression and I would recommend simply playing with the inks and having fun trying different ways of applying them, moving them around on the paper, drying them, and experimenting with different ways of finishing a piece, for example adding mixed media layers or different ways of mounting your work. 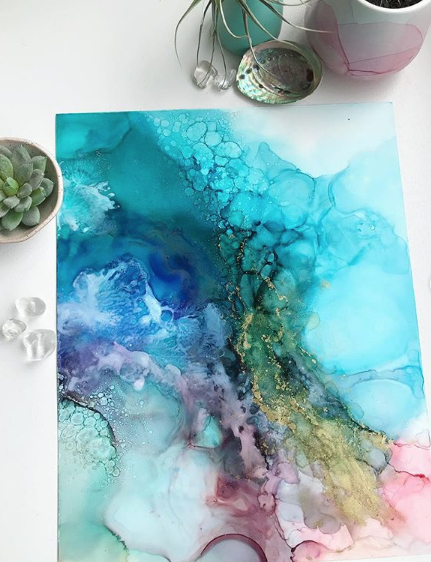 I love the ‘accidental nature’ of inks – the way the painting can take on a life of it’s own and become something other than what you had intended, often becoming even more beautiful! In terms of using alcohol inks, I’m completely self taught. I gained some knowledge about how to use the inks and what materials I could use by following other alcohol ink artists on Instagram. There are amazing artists who share aspects of their process such as @janelovesdesign, and artists who offer online courses, like @jessicayoungart and @oliviajoystudio. I think you can learn the basics from watching other artists but it’s so important to develop your own style by experimenting with different techniques and finding what fits for you. 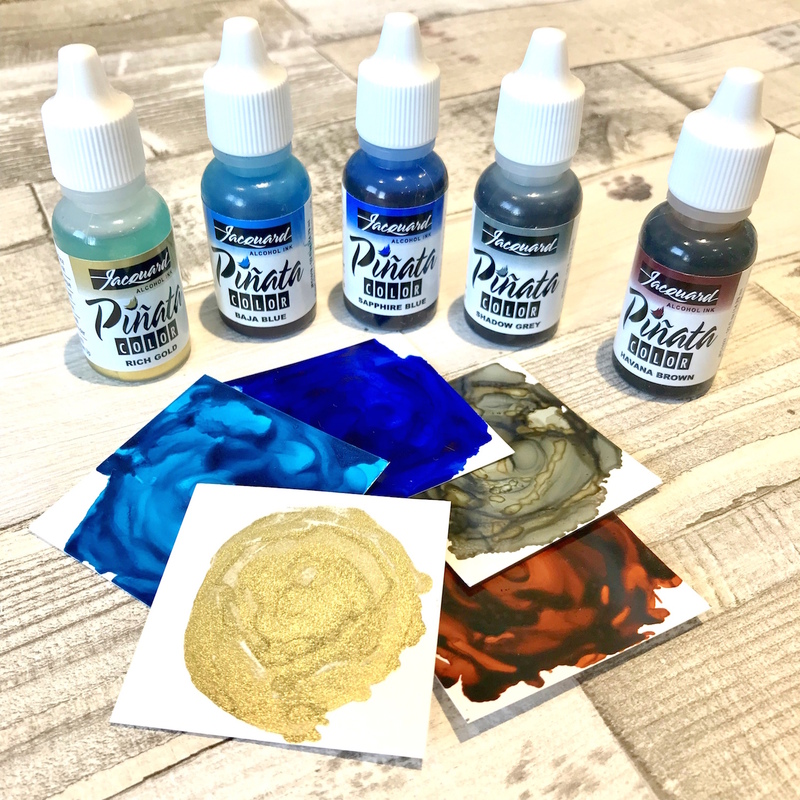 Jenna is giving away 3 Jacquard Piñata Ink colours plus Extender and Legion Yupo Heavy Paper on her Instagram Page along with the original painting she created for this review. Click here to see how you can enter to win! 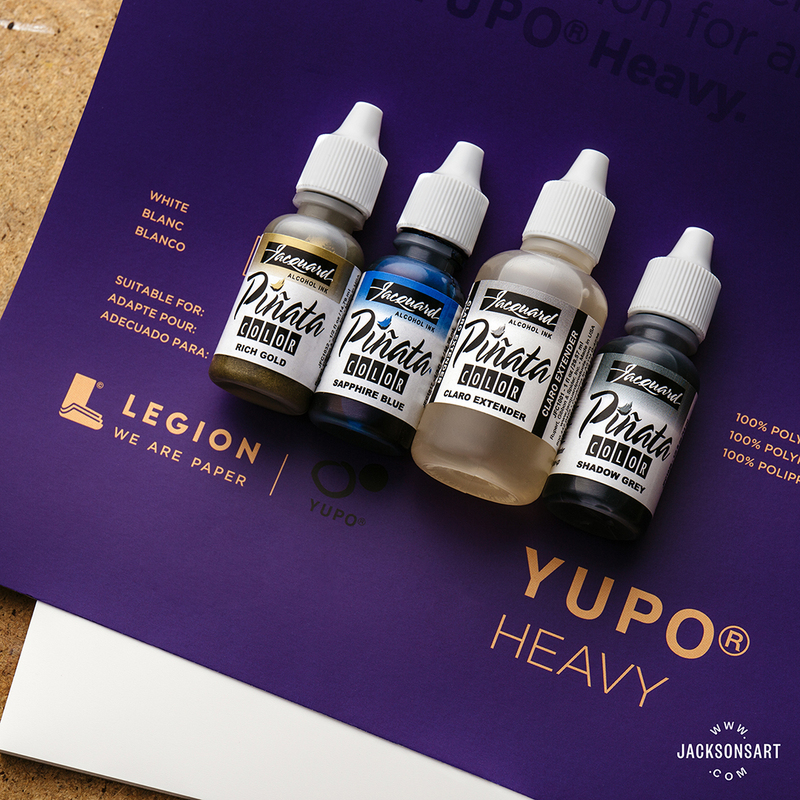 You can view all of the Jacquard Piñata Alcohol Inks online here along with the Legion Yupo Paper range here.